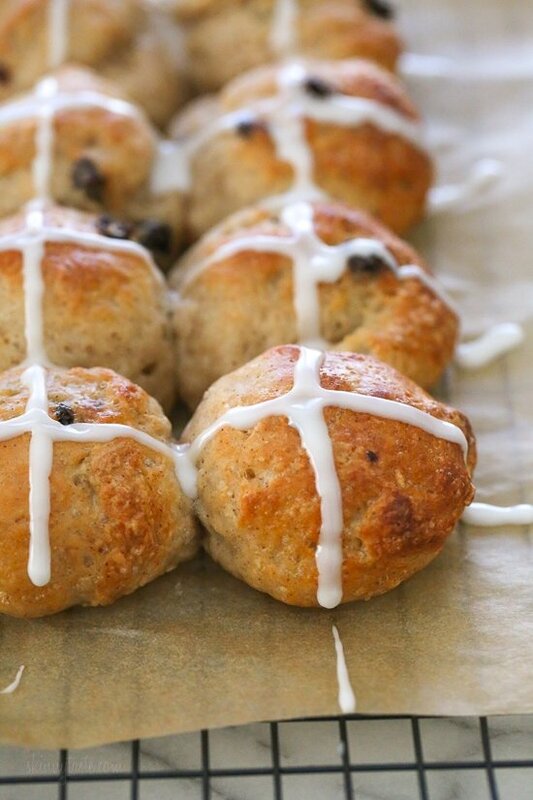 Easy Hot Cross Buns using this easy dough from my Bagel Recipe. No yeast, no boiling, no fancy mixer. Bake them in the oven or in the air-fryer! Serve them Easter morning with some hard boiled eggs and fruit! More sweet brunch additions I love are No-bake Strawberries and Cream Crepe Cake, Honey lemon Bars, and Chocolate Drizzled Coconut Macaroons. 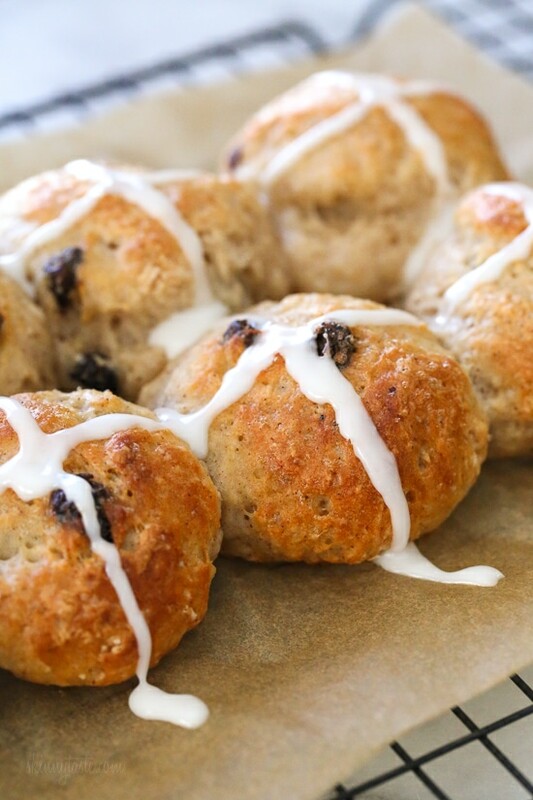 Confession, I have never had a hot cross bun, although I did play it on my recorder in grade school! 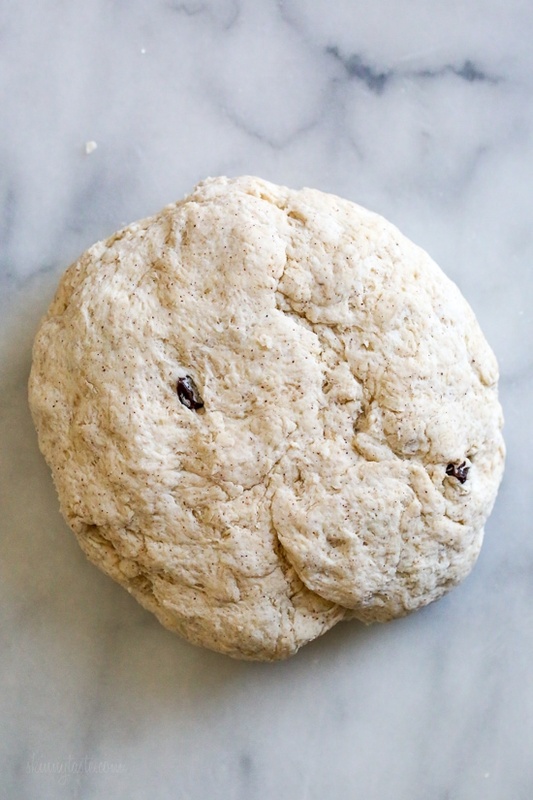 But I looked at several recipes and noticed the dough was pretty similar to my bagel dough, with the addition of raisins, cinnamon and a glaze on top. I tested them out keeping the sugar on the lighter side, since the glaze on top adds more sweetness and we loved them. I guess you can call them bagel cross buns, if you wish! Greek yogurt instead of plain is a must, if there’s any liquid in the yogurt be sure to drain it. I tested with Fage and Stonyfield Greek, both worked great. Chobani has been giving people sticky dough, so I would stay away from that brand for this recipe. I tested this dairy-free a few different ways with success. You can use a thick dairy-free Greek yogurt, Kite Hill (blue label) was the brand I found and tested. This yogurt is not 0 Freestyle Points. Use water instead of milk for the glaze. In a medium bowl combine the flour, baking powder, sugar, cinnamon and salt and whisk well. Add the yogurt and raisins, mix with a fork or spatula until well combined, it will look like small crumbles. Lightly dust flour on a work surface and remove dough from the bowl, knead the dough a few times until dough is tacky, but not sticky, about 10 to 15 turns (it should not leave dough on your hand when you pull away). Divide into 8 equal balls. Place on the prepared baking sheet. Top with egg wash. Bake on the top rack of the oven for 25 minutes. Let cool at least 30 minutes before icing. In a small bowl, whisk the powdered sugar with milk until smooth. Transfer to a small ziplock bag and cut the tip. Ice the tops of the rolls in a cross pattern. Preheat the air fryer 325F degrees and set for 11 to 12 minutes. Transfer in batches without overcrowding and bake 11 to 12 minutes, or until golden. No need to turn. Let cool at least 30 minutes before icing. *Since only half gets used on top, I deducted half of the sugar from the analysis. Planning on making these with my kids tomorrow for Good Friday. Has anyone used GF flour? That’s what we’ll use. They worked! We used King Arthur 1-1 GF flour with 1/4 tsp xanthin gum added. I used Fage non fat greek yogurt & a couple tbsps of TJ’s vanilla greek yogurt since it was already open in the fridge. They were so good they felt a little too indulgent for Good Friday! I just made these, with tweaked spices (a dash each of nutmeg and ground cloves), and substituted candies mixed peel for the raisins, brown sugar for the raw sugar. OMG, YUMMM. 😍. 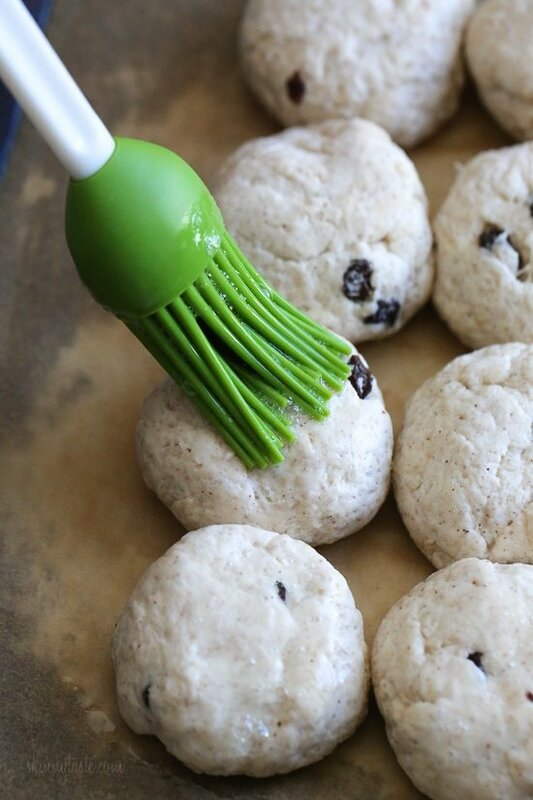 These are definitely going into the baking rotation in my house! Thanks for the Easter gift, Gina!! I really liked them. Mine didn’t look as pretty as yours, but they tssted great and I was skeptical even after they were baking as to if they would taste good. Yum! Just made these and they came out perfect and delicious! 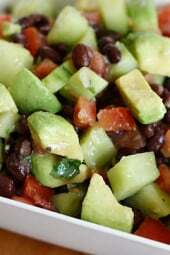 Anyone from Australia made these recipes and can recommend a Greek yoghurt? The only one you mentioned that I know of is Chobani and apparently that isn’t too helpful in this recipe! Maybe I shall have to do trial and error but that might be a bit frustrating and expensive, so…..help! ??‍? As long as it’s thick enough that it doesn’t spill if you invert it, it should work! Just wondering if you had any success with finding an appropriate yoghurt here in Australia? I’ve just found this recipe and would like to try it, so any help would be greatly appreciated! Just put your yogurt in a fine sieve and drain some whey out. These are fantastic! I altered the recipe a bit to add in some light brown sugar, and they were still yummy. I only made 1/2 the recipe since some said they are not the best as left overs. I put cream cheese on one and the icing on the other and both tasted great! 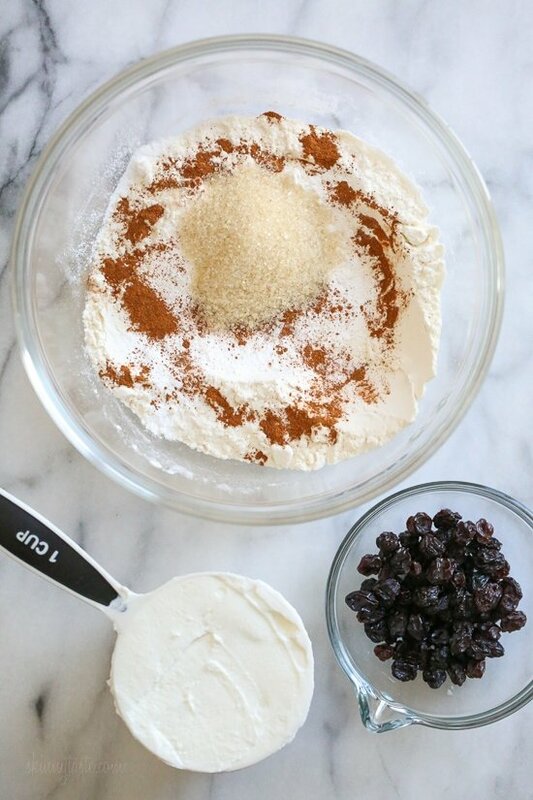 I can see using this recipe for cinnamon raisin bagels. Thanks for another hit Gina! I tweaked the bagel recipe also for a traditional Easter treat, Italian rolls. Instead of plain yogurt I used vanilla flavored, and added fresh orange zest to the dough. Rolled out long lengths, wound into a “nest” and baked. When they came out of the oven I nested an egg on them, then glazed and put a few sprinkles on them, they were delicious! I’m going to buy an air fryer to try this recipe. Can you recommend any air fryer products? – can I make the dough for the HCB and freeze the dough then defrost in fridge overnight , bring to room temp and bake in morning or is it better to bake first then freeze rest to bring 1-2 out to room temp. Will the flavor be same if frozen ? These are super easy and very tasty. Love these! My mom always made these for Easter growing up, as a WW LT member I was so excited to see this recipe. . I made them for Easter Breakfast and they were delicious. I won’t be waiting until Easter to make them again, Thank you so much! I made these last night but the 8 little balls came out exactly as I put them in …..tgey did not spread…..i did use the kite hill yogurt you recommended…. I don’t know what went wrong! ?? 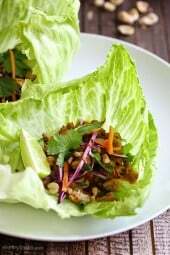 I think this is the 4th recipe of yours I have used and they have all been great. It had become a habit to make canned cinnamon rolls on Sunday morning before church, but in my quest to make healthier decisions for my boys, I cut that out several months ago. So when I saw this recipe I was excited to try it. 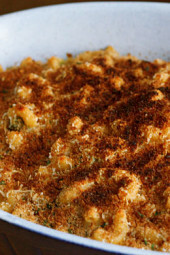 I tried it as soon as the recipe was posted and it got RAVE reviews from my boys. Both asked for more and I’m thrilled that I now have a healthier version of their Sunday morning cinnamon rolls. Thank you, Gina, for all the effort you put into your recipes. My family has loved every single one we have tried!! Big hit in my house! Even with the non-raisin lovers! A note on yogurt brands – I used Aldi’s “Friendly Farms” plain greek yogurt and got great results. Thanks for all you do Gina! Every last one was gone…in minutes! Thanks, Gina! These are soooooo good. Thank you. Family loved it and ate them all. I have tried many of your recipes and have loved them all. This for me was not a hit. My buns were too dense and I had to extend the baking time. As a result the outside was too crusty (over baked) and inside was too doughy. Someday I shall try again. I loved the cinnamon taste and the raisins but the texture was off. Made your bagel recipe quite a few times now and my whole family loves them! So I decided to try these today & they are super delicious! I doubled the batch and followed the recipe exactly & they came out perfect! Thank you! By the way…I used 0 %. Has to be the brand.. I was excited to see this recipe and made the buns right away. Hmmm…I bet the brand of yogurt makes a difference! All I had in the fridge was a store brand of organic Greek yogurt. Talk about sticky! They just came out of the oven looking like craggy biscuits :)Hoping they taste better than they look! Yes I recommend Fage or Stonyfield. Gina, I want to make sure i’m doing this right, for the icing i’m using half of the recipe, so it’s basically 2 Tbs Powdered sugar & 1/2 tsp milk, is that right? Make the whole thing as it’s easier to work with, just don’t use it all. I have made both the bagels and hot cross buns. Love both. Can they be frozen? I make a dozen bagels each weekend then freeze them for my husband and I to eat during the week. They are excellent! Hi, would this work with a non dairy yogurt? would the recipe work if made with baking splenda mix or baking stevia mix???? That would lessen the calories and sugar content a bit. is it 7 points plus another 5 more I noticed a lot of her recipes have this where there will be an addition sign and nother number next to the WW points. Can someone clarify? “Points Plus” is a precious Weight Watchers Program, the “points” were calculated much differently than Smart Points ? Made these for Palm Sunday breakfast. I used half AP flour and half whole wheat flour…. I used currents instead of raisins . Also, in keeping with the Greek yogurt theme, I made the icing using Greek yogurt cream cheese, powdered sugar and a splash of milk. Best part is two buns is one serving!Best when enjoyed same day as baking, not quite as good next day. I am such a big fan of cinnamon buns, I made these instantly after reading your recipe and was really impressed with the results. I had them fresh from the oven with a cup of hot coffee and loved the combination. Cinnamon gave it a really nice flavor which I loved. 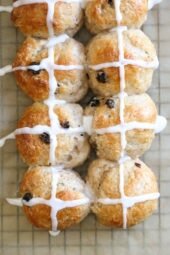 I might try to make these, as from experience HCB’s are very time consuming with needing & proving, but if I do I cannot pass them offf to my family as hot cross buns, as they will absolutely know they are not. Besides the batter not being correct the cross at the top is not a sugar icing glaze, but made out of flour and water. I don’t believe you read the recipe correctly. The cross on top is made using a sugar glaze made of powdered sugar and milk or water; those ingredients are listed at the bottom of the ingredients list. 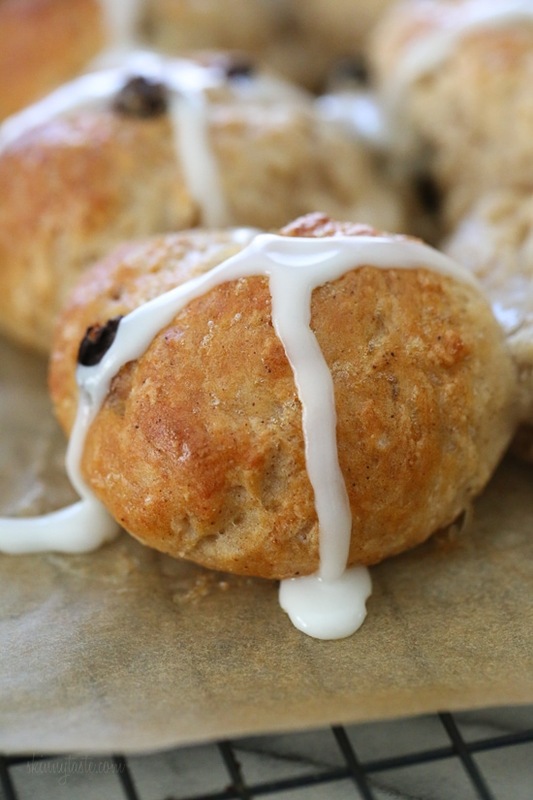 These definitely won’t be traditional hot cross buns; instead, they are a healthier version. I’ve used the dough for several Skinnytaste recipes including bagels and buns and pizza dough. It’s very good and a great low-point and low-calorie substitute to traditional bread. Thank you for the recipe! Can these be prepared the night before, refrigerated, and baked in the morning?? I bet you could. I did this with the pizza dough, rolled them out and refrigerated. They baked fine after sitting out to get closer to room temperature. Easter Morning is fast paced for us. Have you tested how they are if cooked the day before and re-warmed? I was thinking I might try that, but hold off on the glaze until Easter morning. they are best fresh but you can make the dough the day before and keep it wrapped and refrigerated. Can the dough be made ahead of time? Any high altitude tips for these? Thanks! Sorry I don’t know much about that but I bet you can google it! Would I be able to swap out he flour for almond flour? Yum!!! What do you recommend instead of raisins? Nuts? Or just nothing? I have made your delicious bagels. I am interested in the hot cross bun recipe. I didn’t see the proportions for the added ingredients. Can you help me? What could I use in place of the raw sugar that wouldn’t affect the WW points too much? I don’t keep raw sugar stocked. Thank you! 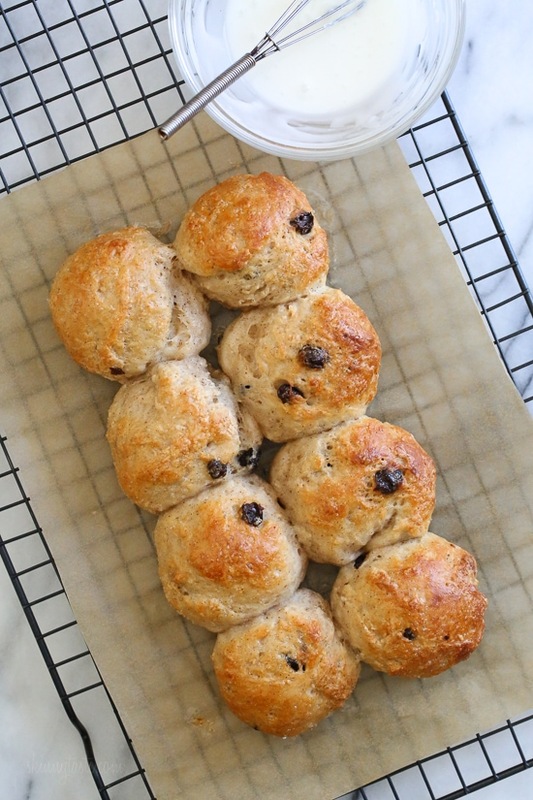 I have been wanting to add raisins to the bagel recipe and looking at low pt Hot Cross Bun recipes. You just solved both issues with one recipe! Where is the recipe? I realize the bagel recipe is the base but what else is added and how much? Raisins? Cinnamon? Glaze?